This article is in need of an update. Once the required information has been added (listed below), this template may be removed. 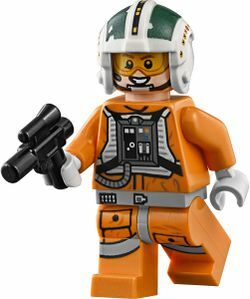 Wedge Antilles is a Star Wars minifigure that first appeared in 2006 in the set 6212 X-Wing Fighter. Wedge's helmet design is exclusive to the X-Wing Fighter and the X-Wing Co-Pack. He has a basic "smiley face" in flesh tones. Wedge has orange legs with a grey leg joint and an orange torso piece with black hands and printing to depict a Rebel flight suit, the same suit that other Rebel Pilots used. Wedge Antilles was one of the most prolific pilots of the Rebel Alliance, who helped to destroy the first and second Death Stars. He flew a Snowspeeder with gunner Wes Janson. Together, they were the first Rebel pilots to take down an AT-AT in the Battle of Hoth. After the Empire fell, he was appointed the Commanding Officer of Rogue Squadron, an elite task force of Rebel pilots. This page was last edited on 10 September 2016, at 03:44.